Pastor Tim Griffin, dean of students at Grand Canyon University, talks with them one-on-one all the time, and his Chapel address Monday morning before another big turnout in the Arena was an opportunity to get an important message to thousands at once. But the message was so simple, so direct and so valuable, the students probably felt as if they were having a personalized chat in his office. Griffin introduced his topic — expectations — with a funny story about an experience he had as a sixth-grader at Disneyland, where the misbehavior of him and his buddies on a class trip gave them an unexpected, behind-the-scenes look that forever altered his perception of The Happiest Place on Earth. He urged Chapelgoers to let God help navigate life’s expectations and not let them throw us off course. God is faithful. Griffin illustrated this by quoting from Lamentations 3:22-23 (“Because of the Lord’s great love we are not consumed, for His compassions never fail”), Joshua 1:9 (“The Lord your God will be with you wherever you go”), and Deuteronomy 31:8 (“He will not leave you or forsake you”). God is forgiving. Griffin referenced Isaiah 1:18 (“Though your sins are scarlet, they shall be as white as snow”), 1 John 1:9 (“If we confess our sins, He is faithful and just to forgive us our sins”), Colossians 1:13-14 (“He has delivered us from the domain of darkness”), and Psalm 103:12 (“As far as the east is from the west, so far does He remove our transgressions from us”). 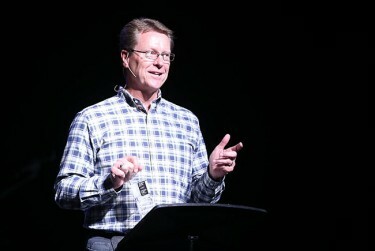 Griffin urged students to stay on two tracks: Love God and those around us, and seek to do good works. For a replay of Griffin’s talk, click here. Next week: No Chapel because of the Labor Day holiday. Chapel returns Sept. 14 with Tim Beal of Cornerstone Church. Click here for the fall Chapel schedule.